Until a few months ago, I had never heard of the American vocalist Steve Cromity. Last September, I visited Emmanuel Baptist Church on Lafayette Avenue in Brooklyn to listen to the Eric Frazier-led sextet known as the Brooklyn Based Jazz Band, and Cromity was one of three singers who appeared with them. 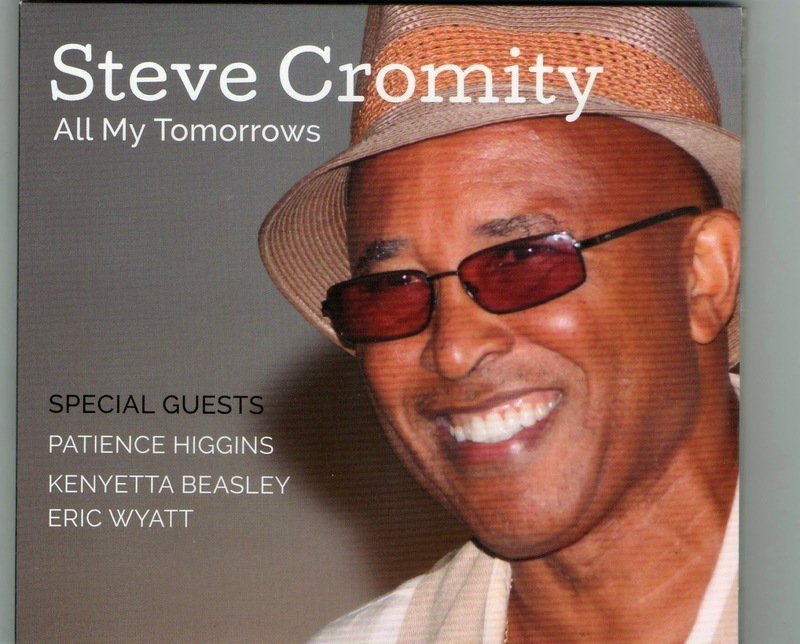 I was quickly won over by Cromity’s easy charm and sincerity, and these qualities are evident on this ten-song set that was recorded in June 2014. Many of the selections are associated with Frank Sinatra or Tony Bennett, and their treatment majors on Cromity’s strong voice and unfussy work from the piano trio and three guest horn-men. The opening Old Devil Moon and When Lights Are Low are typical of what follows. The leader’s intonation and diction are excellent, and Kenyatta Beasley plays obbligatos and tidy solos on muted trumpet. Bass player Eric Lemon is a model of good taste and restraint throughout the album, and leads off How Little We Know on his own. Cromity opines that (Carolyn Leigh’s lyrics) give an “important insight into the nature of human relations” and the group - a quartet here - offers an object-lesson in responsiveness and sensitivity. I’d like to have heard more from pianist Marcus Persiani. Although he takes credit as musical director - and for the arrangements along with Cromity and producer Rob Crocker - his prowess as a soloist is seldom highlighted. His feature on I Was Telling Her is a rare exception. Perhaps the best-known performer is Patience Higgins (whom I have seen leading his own quartet at Harlem’s historic Lenox Lounge; and in London with people as stylistically diverse as pianist Muhal Richard Abrams and the remarkable tap dancer Savion Glover). He is as versatile as ever: on tenor saxophone during the tender title track; with soprano in hand on Where Do You Start, and flute for the attractive bossa nova My Little Boat. The powerful tenor sax on Sugar – by Stanley Turrentine and Jon Hendricks - is that of Eric Wyatt (who is Cromity’s nephew). He is also prominent on Jeannine and Without a Song, and his tone combines particularly well with Beasley’s open trumpet. Drummer Darrell Green kicks along these uptempo tunes with a beautifully light, subtle swing. The name of the record label suggests that the CD is the product of a cottage industry, but you would hardly know. From the clarity of the sound to the photography and digipak sleeve (and despite a couple of minor errors in the liner notes), its standards are very high. There are few surprises and nothing radical on All My Tomorrows. Cromity and his team simply present melodic, uncomplicated mainstream jazz that many will find extremely pleasing.